Initial Lacquer Arctic Night is described as a blue jelly base with holographic silver glitter and green and red micro fine glitter. All nails 2 are coats with a top coat of Seche Vite. Even though this listing says this polish is on the thicker side I didn't experience that at all. The formula was perfect and had a quick dry time. It did dry matte with no top coat, like the listing says, so I would recommend one. The color is mind-blowingly gorgeous! Seriously, I wish my camera could have captured how much this sparkles and shines because it is so pretty! I even painted both hands with this, a true testament to when I love a color! Santa Went Crazy has a sheer metallic silver base with silver shards and various sizes of red glitter. I used 3 coats alone on my index nail and 2 coats of Santa Went Crazy over 2 coats of Butter London Thames on all the other nails. All have a top coat of Seche Vite. I'm not sure how I feel about this polish over Butter London Thames. My husband picked it out and while it does show off Santa Went Crazy's silver base, I'm just not sure I love the combination. If anything it has a holiday vibe. ;) I do like Santa Went Crazy alone though! Formula wise I had no trouble getting out any glitter or with any of the shards sticking up and it had an average dry time. 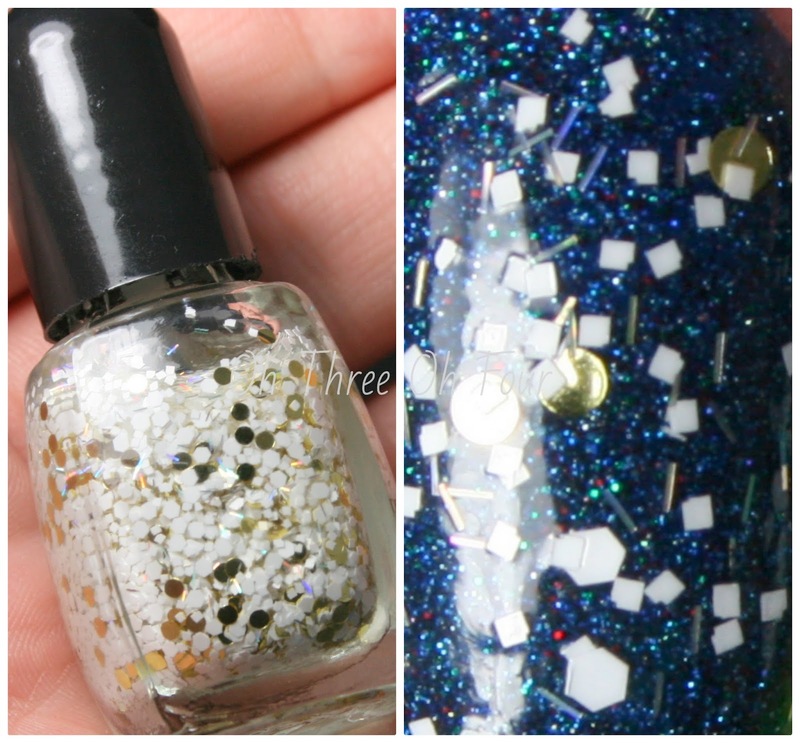 This polish has a little bit of everything: circle glitter (!! ), shards and a unique base color. A little crazy, but it works! Snowy Owl is a clear based polish with gold circle glitter, holographic bar glitter and various sizes and shapes of white glitter. All nails are 2 coats over Arctic Night and a top coat of Hong Kong Girl. Initial Lacquer can be purchased through etsy here. Make sure to follow Initial Lacquer on Facebook here and Tumblr here, to keep updated with new colors Iris, the creator of Initial Lacquer, is whipping up!